It's been a while since I've done a more complex artistic makeup, but unfortunately inspiration wasn't knocking at my door. Then this week's Style Saturday came along with the Avenger's second movie soon to be released and I thought "This could be fun". I tend to like villains way more than super heroes, always have. While everyone's super excited to watch the Avengers saving the day on screen, I'm all "Meh... when does Ultron get here?!" As with cosplay, when doing a character makeup I tend to chose 1 reference picture to follow and that's it. Many characters look different depending on who drew them, or the lighting, the situation, etc. By choosing 1 picture (and 1 picture only) you'll have a clear reference to base yourself off of, instead of making compromises and trying to make multiple references match each other. 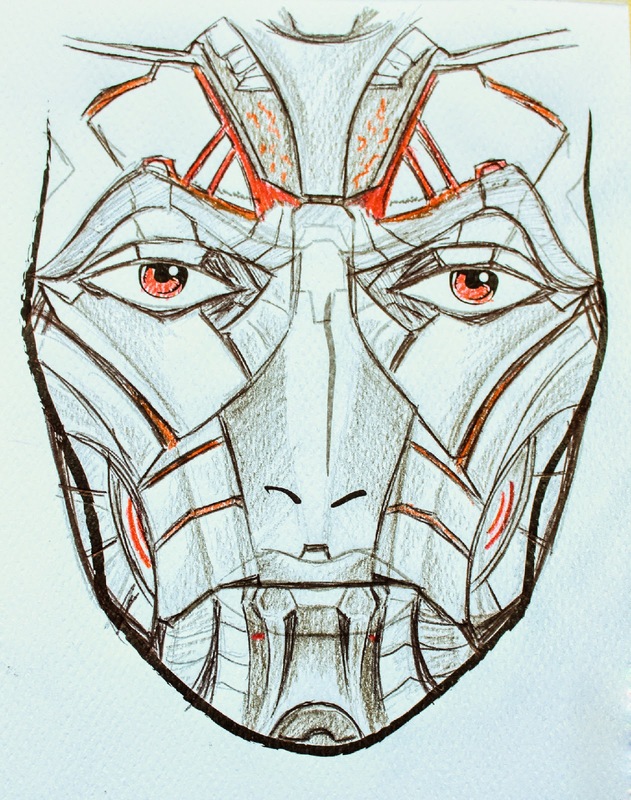 I thought of doing Ultron from the comics, but the new movie version has so many little intricate details that I just couldn't resist trying to replicate. Especially the sunken circles bellow the cheeks. I knew I couldn't just slap on some makeup and hope for the best with this one, so I got my little block of facecharts and got to work with some coloured pencils. When trying to translate something like this onto a human face it can get pretty tricky and proportion is key to making it look good. The biggest challenge is obviously his lack of a nose, but that's something we obviously have to disregard and just hope people will concentrate on the other bits of the makeup. Also, when working on something like this, it's especially important to test out your materials before hand. I tested about 5 different combinations of products to get the right orange for this. I needed something that was opaque enough so it would show up on top of the silver background. I also tested out what made the best shadows over the silver product. 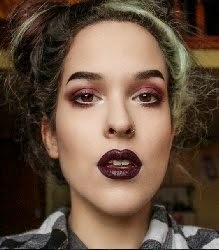 I ended up using black eyeshadow (for the lightest shading), black lipstick for medium shading (it acts like a grease paint, but wasn't as pigmented), and a black grease paint for when I really wanted to darken up the shadows. - Make Up Forever Aqua Cream in "Silver"
- Sugarpill eyeshadows in "Buttercupcake" and "Flamepoint"